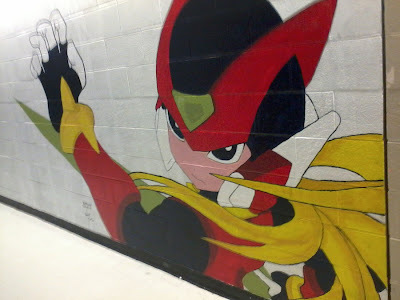 Waaaaay back in 2010, DeviantArt member Saber was asked to produce a mural for her school's anime club. The focus? Why, none other than Zero (in his Mega Man Zero duds, no less). It took a little while, but the red crusader's visage is now complete. It turned out rather well, wouldn't you agree? Well done, Saber! If I bought a pizza for an Anime club, do you think they would enjoy it any less if that Pizza never had its own Anime? @Rockman Probably not. But I bet the intention when offering a free pizza probably wouldn't be that the pizza is representative of the club, which is what I would assume this mural is meant to be. It *is* an anime-styled depiction of Zero, and the Zero series is very *anime-like* itself. Not to mention it looks really cool. I just think it's an odd request to represent an actual anime club. Like, something someone who doesn't know much about anime might ask for. I'm not usually one for fanart and such, but this is pretty good. I'm impressed. @Rockman: If the Obama campaign asked me to design a brochure for their campaign, do you think they'd appreciate it if I drew a Roswell alien on the cover? This will surely boost sales of Zero collection among people in that highschool. Eh, they're probably into manga as well, and there was a MMZ manga. It depicted Zero as a whiny coward when not in his MMZ armor and never got an official translation. It's terrible, but it does exist. So it sort of fits. It is a very nice mural, though. Apparently Anime Club is only allowed to enjoy or have to do with things that have actually had an official Anime. Looks decent! Oh, and Brian, typo: "red crusdaer's" :) I LOVE the red crusdaer!!! @Rockman: Obviously not, but it's logical that an anime club mural would be about anime. Would you paint Shakespeare for a video game club? I would say that Zero is "about anime". @Rockman: Except there is no Zero anime. That makes no sense. PS: I have to get in contact with my old Anime Club and let them know they aren't allowed to play video games at meetings. @Rockman: You keep saying the same thing. It's not that they can't enjoy other things. It just doesn't represent them. And manga =/= anime any more than graphic novels =/= saturday morning cartoons. "Uhm, I was asked to draw a picture on the wall for the animu club at school. The teacher saw a picture of Zero that she liked (I had brought my Official Complete Works to school that day V: ) and she wanted Zero drawn on the wall." So there you go. The teacher specifically asked for Zero.